The first two locks of the day were shared with Mr and Mrs Naval Officer (Rtd), they heading for the Thames and perhaps up to Oxford before returning to moorings on the Leicester Line. 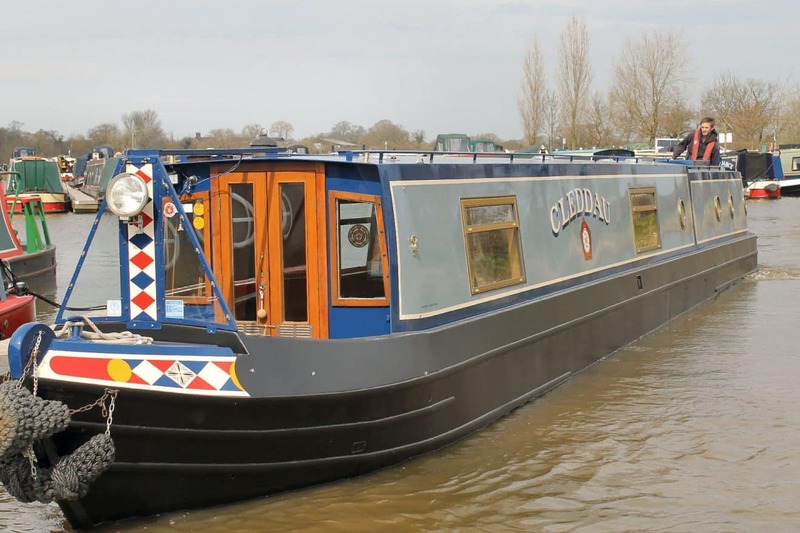 At Marsworth Junction Cleddau was turned sharply to starboard, tied alongside the top of the pair of staircase locks while her crew prepared themselves for the long descent. (“Mid-morning cup of tea first,” insisted Boatwif.) The canal plunges steeply down into Aylesbury Vale, lock after lock after lock, little respite until lock 9. After the broad sweep of the Grand Union here regular canal features seem miniaturised, like the short narrow boat and the few old wooden boats at Bates Boatyard. Hedges line the waterway and it’s not until about half way down that there is chance to look back and see the hills rising to Tring, the summit level of the southern Grand Union. From a pale grey sky raindrops began to fall, lightly, spasmodically, then more consistently – and then torrentially. It was when the rain was running down the neck at the top and down onto the socks at the bottom that a decision to abort was made. Cleddau was hauled onto the landing stage below lock 9 and the crew scurried below to offload rainwater and wet clothes. Lunch was had; hot cups of soup were sipped. The rain eased after a couple of hours so the cruise continued. It was going well: pastoral scenes, a buzzard pair swooping overhead, cows grazing in fields, horses cantering in paddocks. Then, shortly after the sole turning area on the canal, the waterway all but disappeared: reeds encroached from side to side, only a waving green carpet lay ahead. We pushed our way through, on and on and on. More locks, the canal a little wider, but distinctly shallower. Grounded in front of a bridge the Captain gave his orders, Boatwif to stand at the bow to redistribute the weight… Slowly the boat crept on, finally reaching lock 14. Just at the lock forward steerage was lost. The long pole was called into play to negotiate Cleddau into position alongside the towpath. Was this a snapped throttle cable? Or worse, a broken gearbox? The symptoms were unusual, but, trained to eliminate all factors, the Captain lifted the weed hatch. There was the guilty party – a piece of greying carpet neatly wrapped around the propeller! With one slash of the curved pruning knife it was off. The engine was restarted, the lock was prepared, the boat was moved through. What joy, what, relief to find deeper water here. Under cover of darkness he came, a lean young man, equipped with a doctor’s bag. Torches and electric lamps were played over the yawning hole. Down the doctor’s arms plunged; he pushed, he shoved, he groped, he grappled – and then up it came, a long unloved duvet (Tog unknown). It flopped, dead, onto the towpath, but reports are that Cleddau should make a good recovery (until / unless another intruder too tightly cuddles her prop). The “doctor” (marine rescue engineer) says his most difficult and time-consuming removal was a suitcase.